I've been stuck writing this review for weeks. Many weeks. I bought my bottle of Guerlain Black Perfecto La Petite Robe Noire in Italy back in early March because I fell for it on the spot and the husband had his "this is good stuff" face on. I've been wearing Black Perfecto often and in serious quantities (more on that later) and it's great. Is it Guerlain Great? Is there any perfume in Guerlain's current lineup that's that amazing? Why do I make things so complicated? I'm writing the last part of this review while wearing a good dab of vintage Madame Rochas. Guerlain Black Perfecto has absolutely nothing in common with Madame Rochas beyond the vague definition of "perfume". However, I wanted to remind myself of what I used to identify and analyze as a perfume vs. the stuff we buy these days. In that light, do I still like Black Perfecto? Is it a good perfume? As mentioned above I've been struggling with this review. I'm guessing that for the average La Petite Robe Noire customer this flanker is supposed to be a sexier evening fragrance, which should make sense from a a marketing perspective. Personally I'm rather annoyed with thw La Petite Robe Noire range (twenty two flankers after the 2009 initial release which I disliked so much I left the Guerlain counter at Bergdorf without purchasing Les Secrets de Sophie, a perfume I truly wanted and have been kicking myself for missing out on ever since. It's the one that got away that I will forever remember). However, I own and love the 2011 La Petite Robe Noire 2 (that's the cherry marshmallow one), and somehow Black Perfecto seems more related to this happy place in a bottle than to generic original LPRN. Or it might just be my skewed perception. Laurel, Yanni, all that. Guerlain's Black perfecto offers an added light, summer-weight leather note to the cherry. It's tasteful in a way that certain popular leather-cherry tobacco perfumes usually aren't, but it's also sheerer and far less long-lasting than I'd like. If a typical Tom Ford perfume is a commitment until the next shower do us part (or tries to), Guerlain doesn't go there. Instead they use an airy variation on their classic theme of a sweet heliotropish almond and spice (L'Heure Bleue has the more aromatic anise seed in its good versions, Black Perfecto has a slightly stickier yet nice sweet licorice). In this sense it's more Guerlain-like than Mon Guerlain, and I'm all for it, hence the black bottle in the Guerlain section of my cabinet. 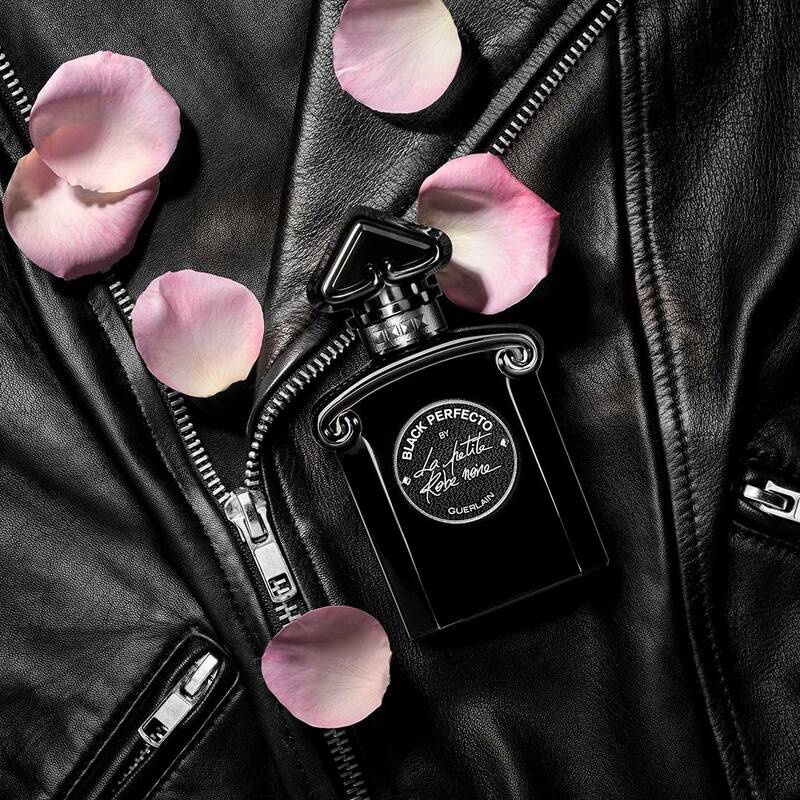 Lest there be any doubt, Guerlain Black Perfecto La Petite Robe Noire is a modern perfume, more easy-going and light than what we usually consider a "leather perfume". For longevity I spray myself with a brow and hair-raising amount and then than add one last spritz under my clothes for good luck. Sometimes I just layer Black Perfecto with LPRN2 and that does the trick as well. It's nice. Good, even, so why not? Because for some reason Guerlain has decided the American consumer is not the target market. While I hear it's everywhere in Europe, from Douglas Parfumeries (their occasional 20% off discounts apply) to Duty Free stores , here in the US you can only buy it from third party sellers of varying reputations. A 30ml bottle is £43.20 in the UK (or £66 for the 50ml). At Parfumerie Douglas the 50ml goes for € 83.00. Top image: model Karlie Kloss photographed by Angelo Pennetta, may 2012, styling by Francesca Burns for Vogue UK. I want to love LPRN, I really do, but something in the series is just off-putting. I'm guessing it's something in the base that throws things off on my skin - it goes entirely screechy and sharp, in addition to too syrupy. But, I've other Guerlain perfumes to love (Jicky, Coriolan and Philtre d'Amour). I do wish they would bring back Philtre d'Amour - I would give my right arm for a bottle of that juice.